Sail: Gaff Cutter: Main, topsail, staysail, jib, drifter. Logan Bros built Rawene for Alf Gifford of St. Mary’s Bay. She was launched on 24th December 1908 for the 1908-9 season and, confusingly, carries “1909” on her tiller head plate. Gifford was a well to do tailor and a skilled yachtsman. Because of the enormous rise in popularity of motor launches at the time, Rawene was Logan Bros’ last major yacht commission before they closed their yard in 1911. She was designed as “a fast cruiser”. The hull was built to the Logans’ extremely high standards, frameless and with three diagonal skins of kauri timber. Technically she was a 9 metre. 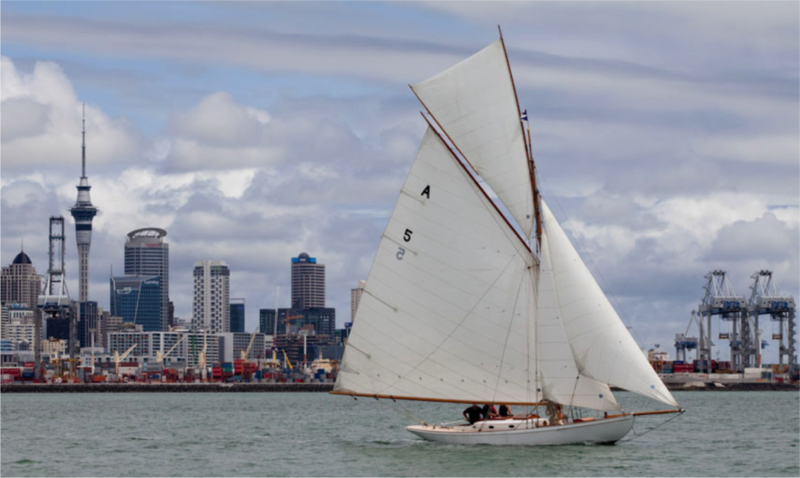 Alf Gifford, and after him his equally talented son Jack, raced Rawene continually with the Royal New Zealand Yacht Squadron from her launching. Both became Commodores, Alf in 1924 and 1935, and Jack in 1953. Rawene had many racing successes over the years. Her performance was so good under her highly developed gaff rig that there was never the temptation to change to the modern Bermudan rig like most of her Logan and Bailey contemporaries. The Giffords always kept her impeccably maintained and except for additional lead on the keel in 1911 never modified her in any way from the original. By 1980, Jack Gifford was too elderly to maintain and enjoy Rawene. He passed her over to the care of the Brooke family who have continued to care for her and race her hard. Apart from unobtrusively installing an engine to suit modern marina conditions, Robert Brooke and his sons and grandsons have done a wonderful job in keeping this Edwardian treasure in fine original order. Rawene was purchased by the Tino Rawa Trust in November 2012.